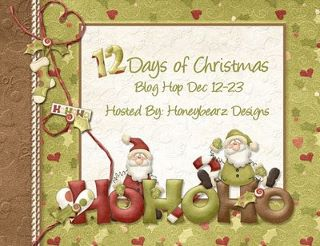 Welcome to Day 2 of the "Twelve Days of Christmas Blog Hop". We are so happy that you decided to join us . If you arrived here from Mindy's then you are on the fight trail. If you just happened upon my blog and would like to join the fun then please start at the beginning with Lisa's Blog. My project for today is a rather unique take on an Advent Calender. The Folded Stars were created with 6X6 Squares of Recollection's card stock in 5 colors. the embellishing was done with gold and silver metallic paper and red green and white Recollection "Lumiere" paper.the corner triangles were embossed with sizzix Frost folder.Each star when opened reveals either a word or a sentiment relating to Christmas.These were taken from "Mixed Holiday Sentiment" by My Creative Time, "Christmas Wishes" by Pink by Design. "Winter Wishes" by K.Andrews and "Christmas Words" by Hot off the Press. The numbers were printed om my computer and cut with the stitched circle die from My Creative Time 's "Build a Banner Kit". The snowflakes were punched with a Martha Stewart punch. Thanks for stopping by I hope you enjoyed your visit! What a fantastic idea, so clever!! I love the colors you chose! I hope all is well my friend!! Looks like you are busy crafting, good for you! This is a fantastic idea!!! What a special way to have an advent calendar, so glad you shared this! beautiful project. unique take on the advent calendar. tfs. What a creative idea for a calendar. It's beautiful. Very pretty!! What a wonderful idea. super cute idea! your blog is full of inspiration! Beautiful advent calendar. Do you add the stars as it gets closer to Christmas or do you take the stars off?